It’s dirt cheap but have a look at what it delivers!!! 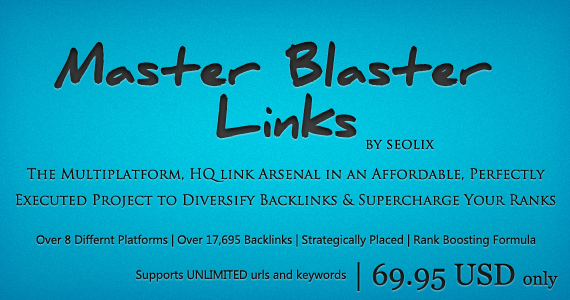 Master Blaster Links package is your best bet for the best and cheapest link building package on the entire industry!!!!!! Behold our Master Blaster blueprint.. Step 1 – One high quality article of 400+ words written exclusively for you and then carefully handspun to over 50% uniqueness. Each spun reads very well. Furthermore, the article will be yours to own. That’s right; you receive the original article and the spuntax version with the final reports. You can reuse this to publish to blog networks such as ALN. Step 3 – 50+ dofollow wiki properties – The most effective form of wikis pointed at your website. Two dofollow links per property. 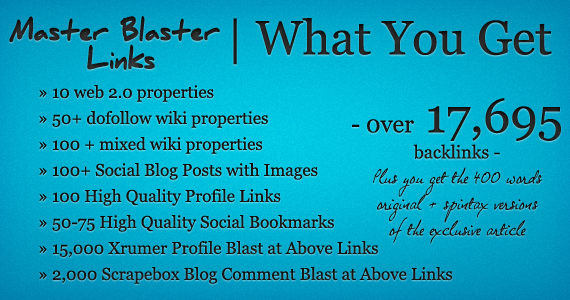 Step 4 – 100 + mixed wiki properties – Appear organic at the same time getting more links to your website; Master Blaster Links leverage diversity. 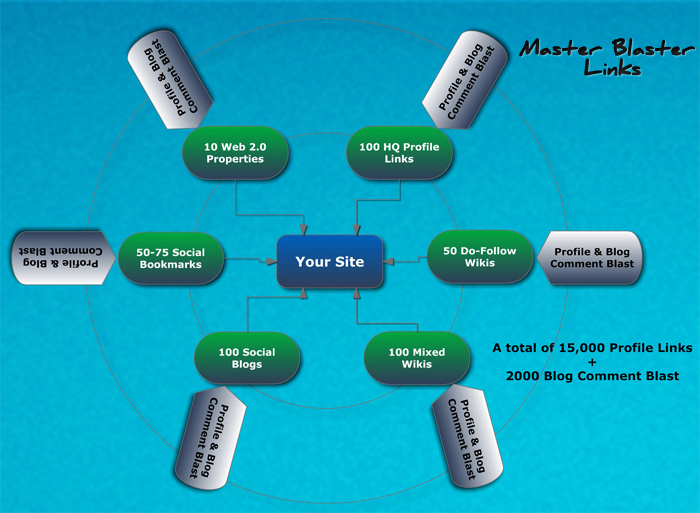 Step 5 – 100+ Social Blog Posts – 100+ social blog posts on over 100 different do-follow domains. What’s more they come with keyword embedded images for better optimization. Step 6 – 100 High Quality profile links – Coming from good PageRank domains, these aren’t simply standalone links. It’s your anchor text wrapped contextually in profiles! Step 7 – 50-75 High Quality social bookmarks – Not from a single platform, our bookmarks are sourced from some the very best authority sites on the whole internet. Step 10 – Final Step – A very detailed report consisting exact URLs under each category. Also comes with the report is your own 400+ words unique + spintax versions of the article. We support unlimited URLs and Keywords! * Once you place the order you’ll be automatically redirected to a form where you can submit order details.